The Green Bay Packers are a championship-contending team with Aaron Rodgers on the field. The NFL is a better league when Aaron Rodgers plays. With that in mind, what transpired in Sunday night’s game at Lambeau had the NFL world on edge. Aaron Rodgers took a big hit in the second quarter, and in the aftermath a Chicago defender fell on his left leg. Rodgers was attended to on the field before limping off. Then after spending some time in the medical tent, the cart was called over and he was taken to the locker room. Many on Twitter were distraught over this development, especially after Rodgers missed so much time last year with his collarbone injury. Fortunately by video, no risk for re-injury to ACL there on that. 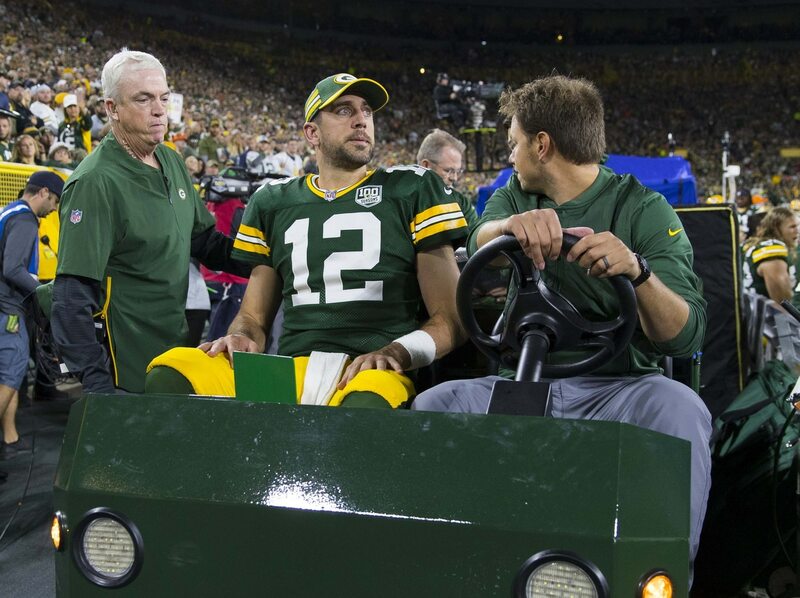 Aaron Rodgers has been carted off of the field. The look on his face seemed awfully similar to last October in Minneapolis. Please let Aaron be OK….Please let Aaron be Ok…Please let—It’s not gonna be OK, is it?